Nothing looks better in your kitchen than a Rogar Pot Rack, so make good use of your rack with additional Rogar Pot Rack Accessories including extra hooks and chain. 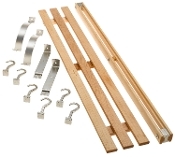 Choose from forty-nine hooks and chain options to match your Rogar Pot Rack. The Rogar Ultimate Wall Mounted Pot Rack has the ability to mount as a vertical or horizontal pot rack depending on your preference and space limitations making this pot rack great for any kitchen. 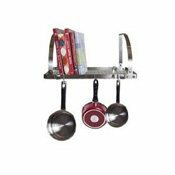 The Rogar Bookshelf Wall Mount Pot Racks is the ideal addition to any kitchen. Rogar pot racks show off a great set of cookware as well as free up precious storage space. Choose from up to thirteen different finish and accessory color options. A Rogar spice rack with three shelves in a black powder coat finish with natural wood shelves. This wall mount rack looks great in any kitchen. This rack has more than enough storage space to keep your herbs and spices at hands reach. A Rogar spice rack with two shelves in a hammered steel powder coat finish with black wood shelves. 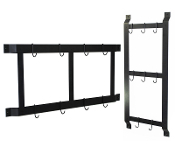 This wall mount rack looks great in any kitchen. This rack has more than enough storage space to keep your herbs and spices at hands reach. 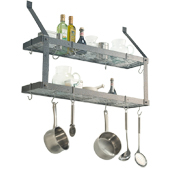 Save valuable kitchen space with the Advantage Components Wall Mount Pot Rack. Handcrafted, tarnish-resistant organizer is made from heavy gauge stainless steel. Adjustable design extends for the best fit for your space. 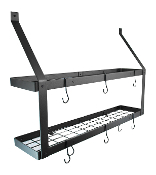 Save valuable kitchen space with the Advantage Components Wall Mount Pot Rack. Adjustable design extends for the best fit for your space.